I started in VGA Planets in 1995 when a friend of mine (known as King Savage to some) introduced me to it. He and another friend of mine, aka R’bok started by playing a shareware game between the three of us. It only took the one time playing to have us hooked, and pretty soon we had ordered the Registered versions of WINPLAN (the one I still use today). We played amongst each other several times, and I usually played the Colonies, which is why I like them today, and go by my alias of CAIN, patterned after Commander Cain, who was the legend in Battlestar Galactica that commanded the Battlestar Pegasus. Of course I was a Lloyd Bridges fan before then but even more after he played him. So to this day I prefer to play the Colonies whenever I can, but then always fall back on the Federation if need be. After playing for a few years, it got to the point where I had been hosting games for other players. I hosted a couple of games privately, then in 2000 I decided to start my own hosting service, and started with a site on Geocities. That site was of course called Ed’s VGA Planets Website, and I had about 30 to 35 players. I was hosting about 6 games or so, and then as time went by it grew to around 15 games, and I decided to expand a little, and moved my site to Tripod.com and it grew even more. 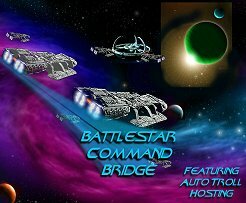 In 2001 I decided to get away from the free site servers like Tripod and such, and went to my own server, and thus Battlestar Command Bridge was born. Since moving to my own paid server the site has grown to over 300 players, and I currently run from 35 - 40 games at one time. The site has grown to include a Forum and many other features, including a full VGA Planets help section, unique and custom ranking system, and some of the more popular downloads. It has won the VGA Planets website of the month award twice, but since that seems to have gone the way of the dinosaur, it probably doesn’t mean much these days. I have written a couple of strategy guides, however don’t consider myself to be an expert in the playing field at all. After hosting for several years, and with the assistance of guys like Merlyn from the Last Domain, my hosting has improved greatly, but I still learn something every day. I guess I spend a great deal of my free time on hosting, and very little on playing. 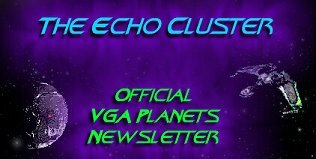 In late 2002, I guess I had too much time on my hands, because I saw that the VGA Community was lacking a newsletter. I could see that the last one only had a few runs, so I embarked on the mission to create an “official” newsletter, getting permission from Tim, Donovan, and a few others to use the name, and some material to get started. Merlyn threw in a monthly column, and now I am looking at over six months of Newsletter, with no lack of material to keep it going. It has grown to be quite a project, and includes information from the entire VGA community. I don’t consider it my newsletter, but everyone’s and hope to see it continue and grow. I guess my plans for the future would include more expansion to the website service, like I just instituted a new “Prestige” Awards system, which recognizes outstanding play in many different areas. I would also like to have more time to play and improve those skills, as well as come up with some sort of “Hosting Help” web page to help new hosts in their mission to start hosting sites.